Floralpunk is a jewellery & apparel brand that is originally founded in Germany and currently based in Saigon, Vietnam by blogger, Julia Doan, who carefully curates the products. A rebranding identity set forth as a small fashion and goods online scene initially, in the ever changing fashion world; envelopes a blend of casual effortless chic. 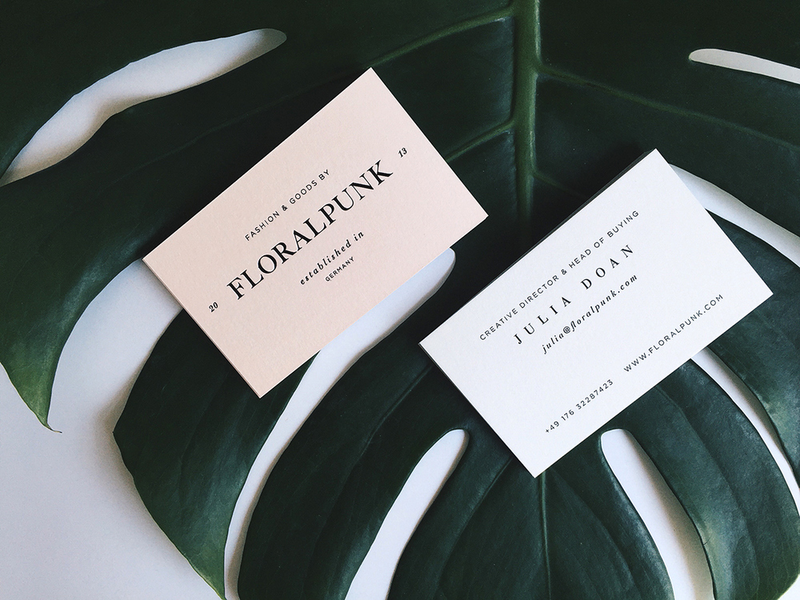 Classically contemporary — the beauty of Floralpunk was inspired by floral organs. Soft delicate pastels embeds the brand's palette. The feminine colour of pink and the classy black creates a stark contrast of the Floralpunk brand. They bring out the characteristics of the psyche of the brand. The photography direction surrounds with floras as the main ideation. In order to devise a brand system, the selection of type played a key role in Floralpunk. It helped to carry out the image of the brand with top notch minimal styling. Foil-stamping of the Namecards gives quiet confidence flawlessly worn — a remarkable touch in the identity. A set of collaterals plays with a tone of black & pink, layers upon layers that softens punk in floral colours.